If you’re fixin’ to buy mailboxes for your home or business, you’re in the right place. U.S. Mail Supply has everything from single box units for homes to pedestal and wall mount mailboxes fort installation in multi-tenant buildings. Along with indoor and outdoor mailboxes, U.S. Mail Supply also carries key holders, drop boxes, trash receptacles and even containers for depositing bags of dog droppings. We only carry top-quality, American-made products, built from steel and aluminum for many years of trouble-free service. Reports of the demise of mail are greatly overestimated. Businesses still need to receive and send out products, bills, checks and other actual things--which is why we carry so many types of commercial mailboxes. Whether you’re a one-man operation or looking to buy mailboxes for a major corporation, look to U.S. Mail Supply for both USPS approved and private use mailboxes. 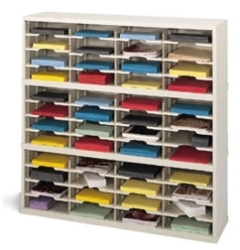 The 4C horizontal mailbox is the standard for buildings with multiple tenants. 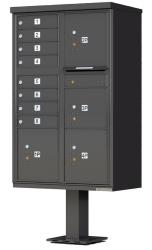 With pre-configured mail slots and parcel lockers, they’re available in surface mount, recess mount and pedestal mount versions in 8 tough powder coat finishes to work with virtually any building’s color scheme. U.S. Mail Supply can also customize a configuration for any space, just give us a holler. The Postal Service will only deliver mail and packages to USPS approved mailboxes. The easiest way to ensure your mailboxes meet their standards is to order USPS approved mailboxes from U.S. Mail Supply. 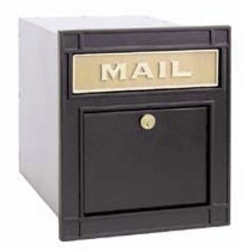 We have a huge inventory of both indoor and outdoor mailboxes that meet Postal Service regulations. 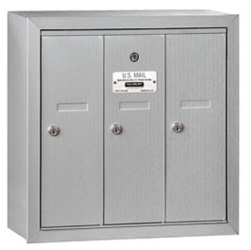 U.S. Mail Supply carries secure, lockable, steel and aluminum mailboxes built to withstand the wear and tear of daily use. 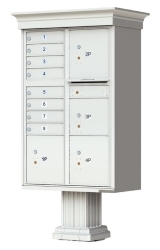 Choose from 4C horizontal lockers for lobby installation or decorative pedestal mount mailboxes for outdoor placement. Available in 8 tough powder coat finishes to blend in with any building’s color scheme. 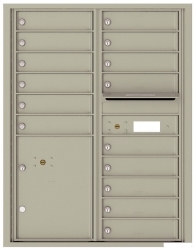 Need outdoor mailboxes for an apartment building, school or business? 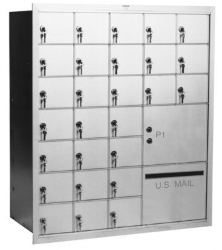 U.S. Mail Supply has USPS approved F-series mailboxes and 4C pedestal mount mailboxes, as well as private use only mailboxes. 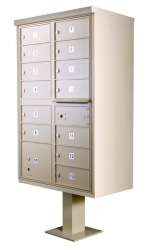 We offer deep customization options with package lockers, key holders and oversized mailboxes. Available in 8 tough, powder coat finishes. Indoor mailboxes don’t have to endure Alabama’s notorious humidity, but they still take plenty of abuse. If you don’t want to have to replace them every couple of years, invest in quality. U.S. Mail Supply only carries American-made, heavy-gauge steel and aluminum mailboxes that are built to last. Choose from USPS approved or private use only versions. Too many homeowners and home builders look for the cheapest mailboxes they can find, only to find they need to replace them in a couple of years. When you buy a mailbox from U.S. Mail Supply, it’s a one-time purchase. Whether you’re looking for something basic or something decorative, you’ll find it here. Mail sorters are essential for keeping mailrooms organized, but they’re also indispensable for helping businesses get organized. Brochures, paper stock, miscellaneous forms—mail sorters are the perfect place for them. Open back, closed back and even secure HIPAA-compliant versions, we have 'em all at U.S. Mail Supply. If you’re looking for mailboxes, look to U.S. Mail Supply. We specialize in top-quality, American-made mailboxes that are built to last. In addition to a staggering array of stock models, we also offer deep customization options to work with any space and any specific needs you may have. Let us know what you need and we’ll be glad to help. Poring over the details of mailbox configuration options isn’t for everyone, which is why U.S. Mail Supply offers free design assistance for custom mailbox configurations. Just click on one of the two options below and enter your responses to the questions about the mailboxes you need. After we receive your completed form, our on-staff designers will figure out the best configuration for your space and create a rendering showing how it will look. We’ll send that to you along with a price quote. If you need additional help choosing the right mailbox, call us at 800-571-0147.